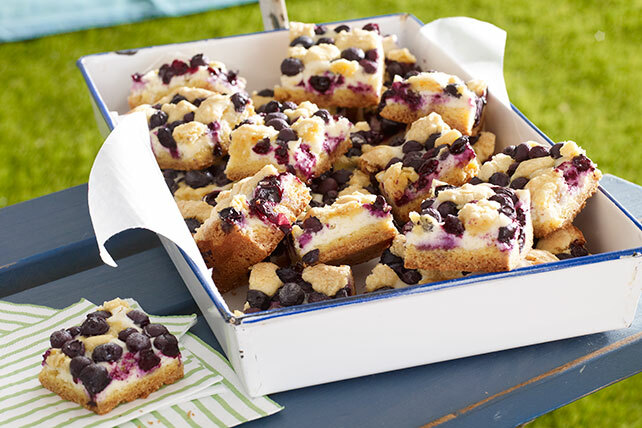 Bake up Lemon-Blueberry Bars for a moist, fruity treat. Our Lemon-Blueberry Bars join yellow cake and cream cheese with lemon zest and fresh blueberries. Line 13x9-inch pan with Reynolds Wrap® Aluminum Foil, with ends of foil extending over sides. Microwave butter in large microwaveable bowl on HIGH 1 to 1-1/2 min. or until melted. Add dry cake mix and 1 egg; beat with mixer until blended. Press 2/3 of the dough onto bottom of prepared pan. For best results, refrigerate the cooled dessert before cutting into bars. Keep bars refrigerated.